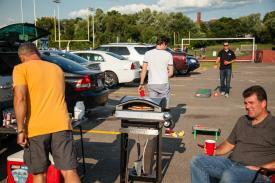 Pre-game tailgating has long been a popular activity before college and professional football games. It is quite popular at football stadiums, and is also spreading to other sports, including baseball and soccer. According to Lake Erie Living, some tailgaters just bring the basics to their pre-game parties, but others bring "every possible accoutrement in a show of one-upsmanship with their parking lot neighbors." If you're in the latter category, you'll be excited to discover these cool items. If you enjoy tailgating before the big game, but don't want to miss any of the pre-game television coverage, the Pathway X1 satellite from Winegard is an item you are sure to love. It is the smallest portable satellite antenna on the market, so it's easy to transport, and you don't have to have a full-time satellite television subscription to use it. RVUpgrades.com describes it as "perfect for tailgating". Pathway X1 works with the pay-as-you-go subscription available from DISH, so you can activate it only for the month(s) you will be tailgating and have access to the same English language HD channels that home subscribers receive, as well as music stations through SiriusXM. This satellite is completely automatic. 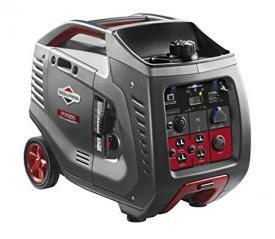 It uses a single coaxial cable can be set up in only 15 minutes. 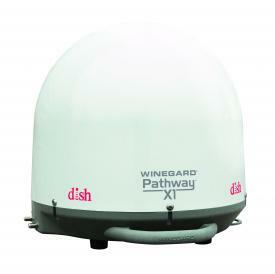 Winegard's Pathway X1 portable satellite antenna costs around $540. Optional tripod or window/side vehicle mounts are available for just under $90 and a roof-mount kit (for RVs) costs around $50. On Amazon, the P3000 unit costs around $1,200. If you're looking for a bit of protection from the elements during your tailgating outings, consider setting up a full tent. If you want your tent to be a real conversation starter, consider setting up the 1965 VW Camper Van Tent from Monster Factory. This unique tent style, which is on Oddee.com's list of the coolest camping tents, is sure to draw attention to your tailgating party, while providing you a place to escape from the wind, and to keep your supplies from blowing away. This waterproof tent is licensed by Volkswagen and is constructed to match the exact specifications of the vehicle it is modeled after. It is large enough to sleep four adults and has a room divider. The tent comes in light blue, red and orange - depending on your favorite team, you may be able to show team spirit through color choice. Orange is a great choice for Auburn, Clemson and Bengals fans, red is ideal for University of Alabama or Falcons Fans, and light blue is ideal for those who cheer for the University of North Carolina or the Tennessee Titans. This super-cool tent costs just under $500. 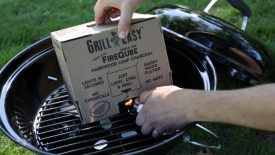 If you want to be able to grill at the stadium but don't want to have to worry about lugging along a heavy and messy bag of charcoal and lighter fluid, the GrillEasy FireQube is an excellent option to consider. The Palm Beach Post lists the GrillEasy FireQube as one of its "top 10 gadgets to get the party started" for tailgaters. It's a single-use cube-shaped container with everything you need to quickly light any charcoal grill with minimal fuss. To use this device, simply place the cube, which is is fashioned from recycled cardboard, in the grill and light its wick. The flame will start to burn the container away and will ignite the charcoal inside the container. Without you having to fan flames, adjust briquets, or do anything else beyond just lighting the the wick, your grill will be ready to go in just 15 minutes. Order from Grill-Easy.com for just $8 each, or purchase from an authorized retailer. Of course, grilling isn't the only option for cooking during tailgating parties. The Alfrescamoré Outdoor Pizza Oven from Cuisinart is a great option for outdoor cooking. It is "designed with the cooking ability of professional brick ovens, but with the accessibility, ease and size of a portable grill", which makes it a great option for cooking pizza, and a variety of other oven-prepared foods (such as wings, nachos and even cookies), during tailgating parties. The Alfrescamoré Outdoor Pizza Oven comes with a pizza stone, pizza peel, smoker box (for authentic wood fired flavor) and a warming tray. The 15,000 BTU gas oven is made of stainless steel and weighs only 35 pounds, so it is easy to pack and transport. This item is available at Amazon for around $250. Having a comfortable chair is key to enjoying a comfortable tailgating experience. 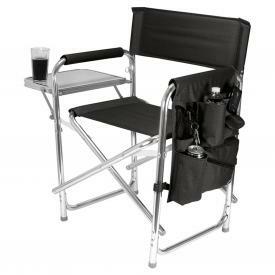 It would be had to find one more well-suited for tailgating than Picnic Time's line of director-style folding sports chairs with a collapsible side table. These chairs have outstanding customer reviews on Wayfair.com with owners praising its comfort, sturdiness and the convenience of having an attached table. Wayfair sent me a review unit to test for myself, and I loved it so much that I bought a second one to using for both tailgating and camping. The side table is an excellent feature for tailgating, as it keeps you from having to balance your plate and beverage on your lap, and the chair itself is very comfortable. Additionally, these chairs have a side flap with built in pockets to hold items like bottled water, keys, electronic devices and other necessities. These extras, paired with an attached shoulder-strap for easy carrying, make this chair a must-have item for tailgating enthusiasts. These chairs are priced from $62 to $100, depending on the specific style selected. The solid color models are the least expensive, with those featuring officially licensed National Collegiate Athletic Association (NCAA) and National Basketball Association (NBA) logos coming in at the high end of the price range. Chance are that you're going to need some heavy-duty tape to hold some of your tailgating gear in place. Not only can it help you keep your stuff secure, officially licensed team logo Duck Tape can also help you show off your team spirt if you're tailgating at a National Football League (NFL), National Hockey League (NHL), Major League Baseball (MLB) or NCAA event. Whether you need to keep tablecloths from getting caught in the wind or if you need to hold signage in place, Duck Tape is a go-to item for all of your temporary adhesive needs. Better Homes and Gardens recommends using this type of tape to tape things down on windy days at the stadium, as well as to secure containers for the trip back home after the game. Purchase licensed Duck brand tape for about $10 per roll. Team logo apparel is critical gear for tailgating. Team jerseys are de rigueur for professional sporting events, while college game apparel seems to vary from very casual to super-dressy based on tradition. Whether you wear casual or more dressy apparel to tailgating parties, as USA Today points out, cowboy boots with college logos are "a stylish way to show off school spirit." 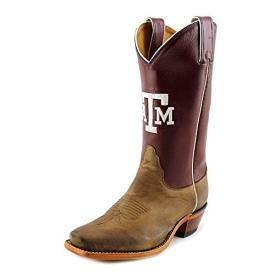 According to TotalFratMove.com, cowboys boots are a popular footwear option for college football games in the southeastern U.S. - and thanks to popular boot manufacturer Nocona, you can now get quality boots that feature your school's officially licensed logo. When Nocona first introduced its College Boots line, most of the available schools were concentrated in the southeast and Texas. Now, though, boots are available with logos from almost 50 schools throughout the United States, representing major universities with large student and alumni populations from coast to coast. Visit CollegeBoots.com to see a complete list of participating schools. Maybe your alma mater is included! Nocona boots are available for men and women from a variety of retailers. Prices range from around $175 to $400 per pair. These fun items make it easy to tailgate in style - and they represent only a few of the many great options you may want to consider for your next tailgating party. No matter what gear you have, though, what's really important is the fact that you get to support your team in the company of family and friends.